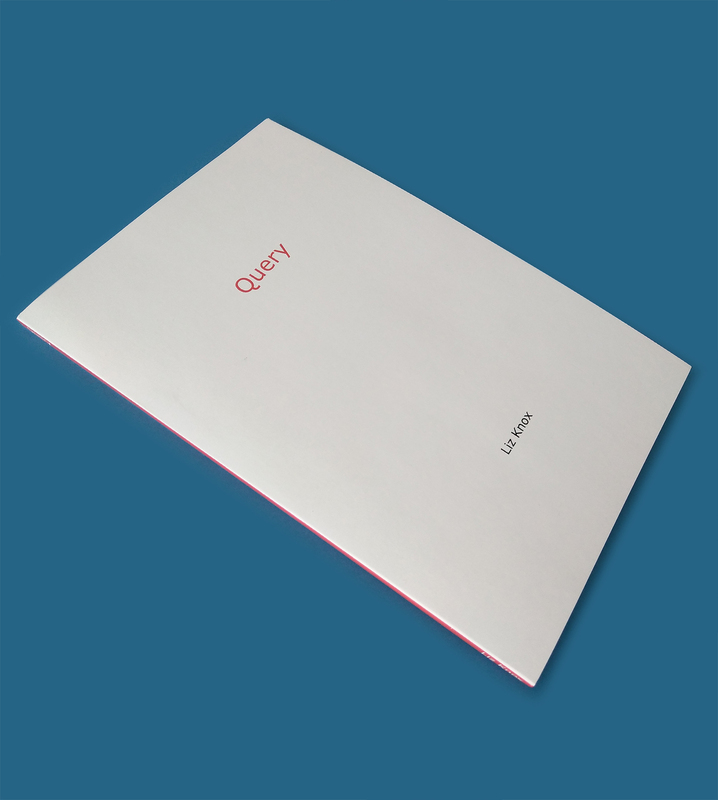 Or Bookstore is pleased to host the launch of Query: A compendium of Reddit threads, questioning the reality quotient of television shows, an artist’s book by Liz Knox. Please join us April 6 at 2 pm to celebrate the release of this multifaceted inquiry into popular culture, contemporary identity building, and the drive to find authenticity in the scripted. Query tracks this seemingly endless search for truth in fiction. Exploring everything from the attempt to understand one’s own identity through televised representations to how accurately a certain vocation is depicted, the book generates one long search for reality and self-identification in some of the most unlikely fictions. Query will be available for purchase and the artist will be in attendance. Liz Knox uses conceptual strategies to examine systems of interpretation with an emphasis on irony. Language is the most major through line in her work, and a common starting point is found text. Query is her fifth artist’s book, following after Commentariat (2017), which compiles “A short history of politics in North America as told through the Savage Love advice column comment threads,” and Missed Connections (2012), which generates a portrait of Occupy Wall Street using Missed Connections posted on Craigslist from protests and camps across North America. Knox studied studio art at the University of Guelph and completed her MFA at Emily Carr University of Art and Design, Vancouver, in 2013. Her work has been shown in exhibitions and film festivals across Canada, including at Mercer Union, Toronto; Access Gallery, Vancouver; Paved Arts, Saskatoon; WUFF, Winnipeg; and Justina M. Barnicke Gallery, Toronto. Currently, Law and Order (2018), a video installation using Law & Order footage, can be viewed at Vtape, Toronto, as a part of the exhibition …any resemblance to real persons, dead or alive, is purely coincidental.